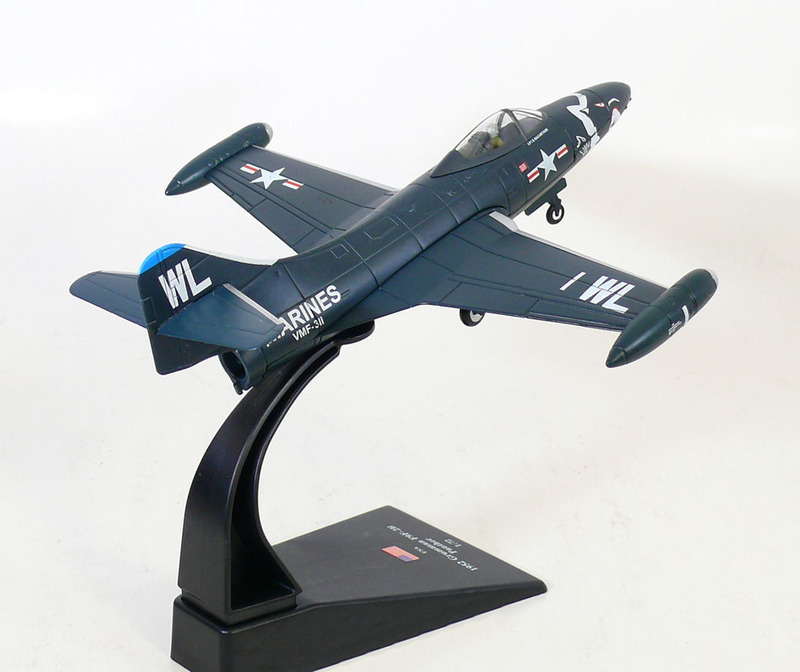 The Grumman F9F Panther was the manufacturer's first jet fighter and one of the United States Navy's first successful carrier-based jet fighters. A single-engined, straight-winged day fighter, it was fitted with an armament of four 20 mm (0.79 in) cannons and could carry a wide assortment of air-to-ground munitions. The Panther was used extensively by the U.S. Navy and the United States Marine Corps in the Korean War. Total F9F production was 1,382. Several variants were exported to Argentina. The Grumman Panther was the primary U.S. Navy and USMC jet fighter and ground-attack aircraft in the Korean War. The Panther was the most widely used U.S. Navy jet fighter of the Korean War, flying 78,000 sorties and scoring the first air-to-air kill by the U.S. Navy in the war, the downing of a North Korean Yakovlev Yak-9 fighter. F9F-2s, F9F-3s and F9F-5s, as rugged attack aircraft, were able to sustain operations, even in the face of intense anti-aircraft fire. Despite their relative slow speed, Panthers also managed to shoot down two Yak-9s and seven Mikoyan-Gurevich MiG-15s for the loss of two F9Fs. On 3 July 1950, Lieutenant, junior grade Leonard H. Plog of U.S. Navy's VF-51 flying an F9F-3 scored the first U.S. Navy air victory of the war by shooting down a Yak-9. 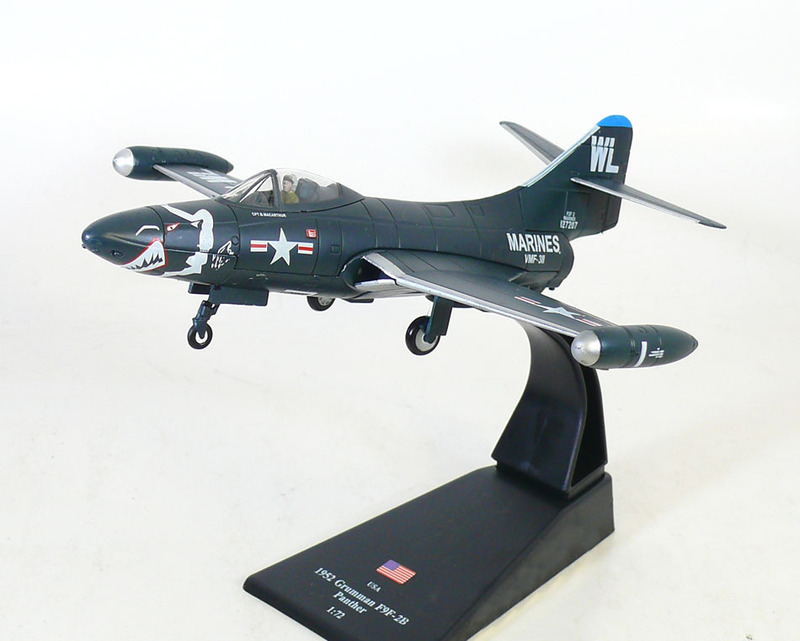 The first MiG-15 was downed on 9 November 1950 by Lieutenant Commander William (Bill) Amen of VF-111 "Sundowners" Squadron flying an F9F-2B. Two more MiG-15s were downed on 18 November 1950. The final four MiG-15s were downed on 18 November 1952 by Lt. Royce Williams of VF-781, flying off the carrier Oriskany during a series of air strikes against the North Korean port of Hoeryong, right across the mouth of the Yalu River from the major Soviet base at Vladivostok. Williams' victories were notable because all four were flown by Soviet Naval Aviation pilots. Panthers were withdrawn from front-line service in 1956, but remained in training roles and with U.S. Naval Air Reserve and U.S. Marine Air Reserve units until 1958. Some Panthers continued to serve in small numbers into the 1960s. The only foreign buyer of the Panther was the Argentine Naval Aviation, which bought 24 ex-USN aircraft in 1958. The catapults on the then only Argentine carrier, ARA Independencia (V-1), were considered not powerful enough to launch the F9F, so the aircraft were land-based. Argentine Navy F9F-2 Panthers saw combat in the 1963 Argentine Navy Revolt, bombing and strafing a column of the Army 8th Tank Regiment which was advancing on the rebelling Argentine Base Aeronaval Punta Indio. The attack destroyed several M4 Sherman tanks, at the cost of one F9F Panther shot down. The Argentine Panthers were involved in the general mobilization during the 1965 border clash between Argentina and Chile but no combat occurred. They were taken out of service in 1969 due to the lack of spare parts and replaced with Douglas A-4Q Skyhawks.